This particular Red Tree can be found right outside the door of the office. I waited until the sun was getting a bit low in the afternoon so the effect of light coming through the tree would be maximized. Or, another theory might be that I just happened to think of taking this picture at a time which coincided with a sinking sun, thus lucking into the back-lit tree. Either way, the effect certainly adds to the image, I think. I'm sure this is some sort of tree common to the area. I can find similar trees without too much difficulty. However, I especially like the fact that I can step outside my door and be looking at this tree literally within seconds. In fact...I just did such a thing right now. When I lived in "the city that shall not be named", I had few, if any, such opportunities. For those of us who appreciate Red Trees in the Fall, living in the boonies isn't always so bad. Below is the same Red Tree, but I played around in Photoshop to create an effect. I'm not sure which image I prefer, but I am sure that I prefer living where I can step outside and see such a tree versus living where I can't see such trees. This Photoshopped tree to the right certainly looks less real than the other image. As it should. 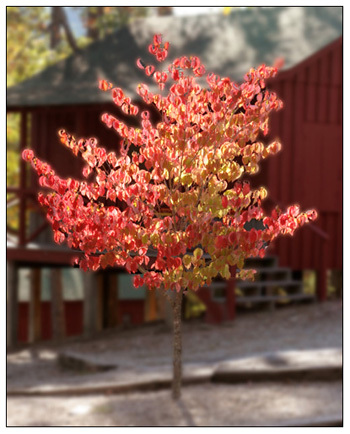 I applied a blur effect to all of the photo except the leaves and branches, along with a bit of "glow." I faded out the blur effect as I moved up the trunk of the tree. It's an interesting look, but I've decided I prefer the real deal. Well, I hope you've enjoyed the Red Tree. He (or she) won't be around much longer. Perhaps in a month or so I'll post another photo of this particular tree, just for comparison. Or, if the tree gets even redder ("more red"?) I'll snap another photo. 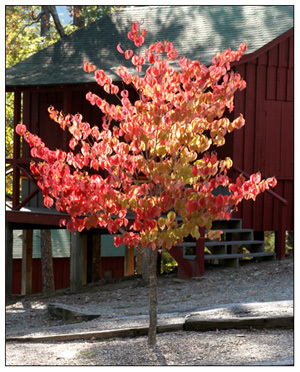 Either way, I think the Red Tree has been a fine way to start off the Picture of the Week (P.O.W.) gallery! I love the picture...all of the pictures. I also enjoyed reading your mini essays. Wow! You are full of insight. Anyway, thank you for posting that picture.